"We encourage the use of contraception as a safe & humane management tool for pigeons"
There is no such thing as just one ! 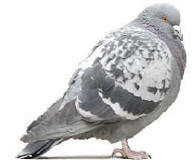 Pigeons can breed all year long in the southwest and one mated pair can turn into a flock of a dozen or more in a year. In collaboration with the USDA/APHIS, Innolytics LLC has developed non-lethal and humane technology that can effectively decrease the hatchability of pigeon eggs by feeding treated bait during their reproductive season. The effects are fully reversible and the company has designed a controlled baiting program that virtually eliminates any impact on non-target birds. The technology complements other programs of bird population management such as habitat modification, physical barriers and hazing methods. Detailed studies on environmental impact on other animals and humans indicate no effects on other species. Furthermore, the hatchability of eggs from a bird of prey, such as a falcon, will not be affected by consuming treated pigeons. The new technology is ideal for wide area sites where some pigeons can be tolerated. Manufacturing facilities, transportation hubs, urban areas, hotels, schools and airports are typical application areas for OvoControl P.
This automated feeder is placed on a secure flat roof top location, the timer is set to dispense approximately 10 ounces of bait per 25 pigeons out about 20 feet from the feeder and will do this 7 days a week. Large flocks will require several feeders place on the rooftop to make sure that all the pigeons feed evenly. The bait is a restricted use only product and is used in reducing egg hatchability in pigeons. As long as the pigeons eat the bait they will remain sterile, if they stop eating the bait for 30 days they will be able to have babies again. The LA times reports (June 9) that OvoControl P is reducing free-ranging pigeon populations in Hollywood. When this test began last August, I thought it would probably fail due to in migration of bird from surrounding areas. Well, they've had almost a year to migrate in and the contraceptive is still reducing overall numbers, more than a 10-fold decrease in one area in only 4 months according to the LA Times report. Congratulations to the Argyle Civic Association who had the foresight to fund this project and to everyone else who was involved. Read more on this topic in my November 1, 2007 and June 11, 2008 posts in the What Works section. For more, see the George Rotramel website at www.GeorgeRotramel.com. One of the challenges of using OvoControl P is evaluating the pigeon population at a treatment site. A camera is watching the pigeons consume OvoControl on a rooftop in San Diego, CA. Using an automated digital camera makes counting pigeons and making observations a whole lot easier -- especially when the camera automatically delivers the pictures to your computer each morning. Follow the time stamps -- six "early birds" arrive at the crack of dawn and wait patiently for the feeder to go off at 7:00AM. The second photo is taken 30 seconds after the feeder is activated -- note the difference. There are roughly 120 birds feeding. Also note the absence of non-target birds in the feeding frenzy. Approximately 60 pigeons are still there at 7:02AM, but the bait is already all gone. 10 minutes later, the birds have given up hope that the feeder will turn on again and move on to better foraging opportunities. For the next hour or so, single birds will still show up from time to time and trip the camera. After that, nothing moves at the site until the next morning. Frequently Asked Questions (FAQ�s) about OvoControl P in Pigeons. 1. What exactly is OvoControl P? OvoControl-P is a product specially formulated to help control the hatchability of eggs from feral pigeons. The active ingredient is nicarbazin, originally used as a drug to control an enteric disease in chickens and now developed as a hatch control technology for pigeons. 2. How does OvoControl P work and how does it affect hatchability? OvoControl interferes with the development of the vitaline layer separating the egg white and yolk. This membrane is vital to the viability of the egg and without it the egg cannot develop or hatch. 3. Does the use of OvoControl P in pigeons require a permit from F&WS? Feral pigeons are considered an invasive species and not protected under the Migratory Bird Treaty Act. No permit is required by F&WS. Check with your local authorities to determine if any other permits may be required.
. 4. What does OvoControl P cost? Depending on the distribution channel, the cost of OvoControl is approximately $8.80/lb. Put differently, it costs roughly $10.50/day in OvoControl bait to treat 100 pigeons. 5. What are the opinions of animal welfare groups to OvoControl P? The Humane Society of the United States, PETA as well as other animal welfare groups support the use of non-lethal technology to moderate the populations of feral pigeons. Left unchecked, pigeon numbers in a local flock can grow very rapidly. Innolytics egg hatch control technology enhances the quality of life for pigeon populations while controlling their numbers. The effects of OvoControl are analogous to spaying and castration programs in dogs and cats, except that OvoControl is reversible. 6. Can pigeons consume so much bait that they get too high a dose of OvoControl P? No. A single day dose that would be 3 to 4 times the anticipated dose of OvoControl would not produce any toxic effects. In the event that this did occur, the result would be that blood levels of nicarbazin would be increased and absorption of the nicarbazin in the yolk of the egg would also be increased. 7. What happens if a raptor consumes a pigeon that has been treated with OvoControl P? Will the raptor�s eggs also not hatch? Fortunately, the chemistry of the active ingredient assures that there is an extraordinarily low risk of any effect on a raptor. To have an effect, the bird MUST consume the bait � raptors enjoy fresh meat and fish, not OvoControl bait. Once OvoControl is digested and absorbed, it is no longer biologically available to another bird. There is effectively no risk of secondary toxicity. 8. How quickly is the active ingredient, nicarbazin, eliminated from soil and the environment? Carbon 14-labeled nicarbazin studies have shown that the half-life of nicarbazin in the soil is approximately 49 weeks in field soil and 18 weeks in greenhouse soil. The increased rate of degradation in greenhouse soil is likely related to increased temperatures maintained in the greenhouse. Studies of labeled nicarbazin in field soil plots have shown that the nicarbazin incorporated into the upper 3 inches of soil does not leach through the soil beyond 6 inches in depth and slowly degrades over time. 9. OvoControl could get into the aquatic systems through unconsumed bait or pigeon feces. What will happen to OvoControl P once it enters aquatic environments? Nicarbazin as a complex has poor solubility in water. As nicarbazin goes into solution it dissociates into DNC and HDP. HDP facilitates the absorption of DNC in the gut. Nicarbazin is excreted as DNC and HDP; DNC excreted in the form of pigeon feces would not be well absorbed from the gastrointestinal tract and would pass through the animal with very minimal absorption. 10. What can you expect in terms of feral pigeon population control following the first year of use? Under ideal conditions, with all pigeons in the area consuming the appropriate dose during the breeding season the expected outcome is no new pigeons. The average lifespan of a pigeon is 2 to 4 years, although the population turnover through predation and disease is very high. The objective for OvoControl is to minimize the hatchability of pigeon eggs. Studies conducted in Italy, show a declining population of pigeons with the lower population density dominated by adult birds. 11. Will the pigeon still lay an egg(s)? It is quite likely that each female pigeon will still lay one or two eggs. If the OvoControl dose is high enough and the blood DNC levels are high enough, fewer eggs than normal may be laid. OvoControl mainly works to reduce hatching of the eggs that are laid. This is actually a beneficial effect, as the pigeon will stay at the original nest and incubate the egg(s) rather than leaving the site and starting a new nest elsewhere. 12. How long does it take for the effect of OvoControl P to wear off? OvoControl must be consumed for several days to achieve blood levels that affect the hatchability of eggs that are forming. Nicarbazin is undetectable in the plasma 4-6 days after consumption of the OvoControl bait has stopped. Once the level of DNC falls by approximately one half its peak levels, the effect on egg being formed has almost disappeared. 13. What advantage does OvoControl P have over other chemical control programs? Use of OvoControl allows for the reduction in hatching of eggs laid by treated pigeons without requiring lethal control. 14. When do you start and stop using OvoControl P? OvoControl baiting can begin at anytime during the reproductive season. Pigeon reproduction is concentrated in the spring through fall, although depending on the climate; they can reproduce throughout the year. With adequate food, water and nesting sites, pigeons can hatch eggs as often as every 6 weeks. 15. Is there a pre-baiting period? No. Since OvoControl is not toxic, there is no requirement for a pre-baiting period. Nevertheless, some customers prefer to pre-bait, especially with a pigeon population which have been acclimated to high quality seeds and grains. These birds are generally more difficult to switch to OvoControl P.
16. Where should the bait be broadcast or feeders located? Ideally, bait is offered at dawn on urban rooftops in the areas where pigeons are nesting or feeding. For more permanent feeding installations, Innolytics offers automated feeders to ease the labor and manpower burden of daily feeding. 17. What are the advantages of using an automated feeder? The OvoControl automated feeder provides an automated delivery system for the bait. The feeders come with digital controls allowing the applicator to dispense the appropriate quantity of OvoControl at pre-programmed 24-hour intervals. The units are equipped with a battery and optional solar charger. 18. Do the baiting sites need to be monitored? OvoControl is offered in the early morning on a daily basis. Initially, each site is observed for approximately one hour to ensure that pigeons are eating the bait. With automated feeders, baiting can be preprogrammed to dispense the appropriate amount of bait once or twice a day, with weekly inspections to observe feeding behavior and to refill the bait. Some applicators are using automated cameras to supplement monitoring. 19. Who will be allowed to use the product? The product is intended for use by licensed businesses (Pest Control Operators), government agencies and municipalities for the control of feral pigeon populations. 20. Since this product will be delivered under free-feeding conditions, how can you be sure you are not over- or under-dosing the pigeons with OvoControl P? It is very difficult to administer exact doses of OvoControl under free-feeding conditions such as those that will exist using broadcast application. However, OvoControl has been shown to have a wide margin of safety and efficacy. 21. Can you skip a day or two of bait and still get the desired effect? If the pigeon skips eating for a day or two, what happens? The ideal situation would be that each pigeon consumes 5 grams of bait each day. Bait should be available every day to maximize the chances of the pigeons getting their daily dose of OvoControl. There appears to be a threshold level of DNC in the blood required to affect hatchability of the eggs formed during that time period. If a pigeon doesn�t eat the bait for a day or two, it is likely that the DNC levels in the blood will fall and may fall below the level required to affect hatchability. The DNC levels in the blood will rise again when the pigeon consumes more bait, and the eggs formed during the time when the DNC levels are high again would be affected and may not hatch. The bait is relatively large, suitable for a pigeon but not to the average songbird. The bait has low oil content. The bait is fed on a restricted basis�roughly 5gm/bird, or roughly 15% of the pigeon�s daily dry matter intake�at the crack of dawn, in the general vicinity of the over night birds. Experience shows that once the pigeons are habituated to the bait, it is consumed in 15 minutes or less leaving little opportunity for non-target feeding. Pigeons are flocking birds. Feeders are placed on rooftops where the risk of non-target exposure is limited. A daily dose is required during the breeding season. It is possible that a non-target receives a dose from time-to-time, but periodic observation by the applicator ensures that OvoControl is reaching the target population. Raptors will not consume bread based bait. 23. How does the pigeon breeding season compare to other bird species? Depending on climatic conditions, pigeons can breed year round. 24. What is the effect on non-target mammals? Based on the very limited exposure potential, studies in non-target mammalian wildlife have not been conducted although nicarbazin has very little effect on mammals. Adverse effects that have been noted in mammals have been observed only after long-term treatment of one year or longer. OvoControl is considered �practically non-toxic� by EPA.